For Your Intimate Gatherings. 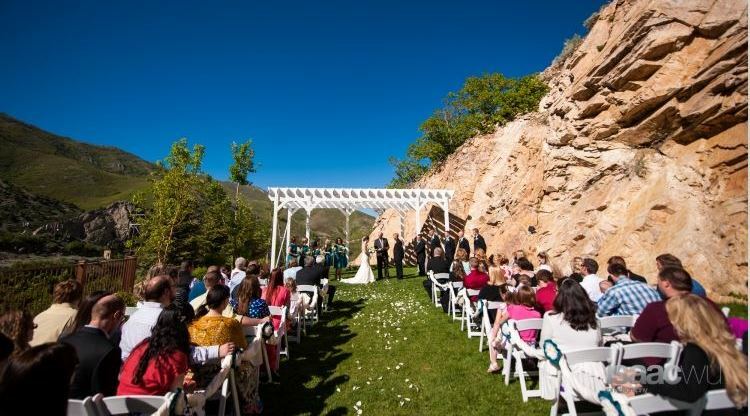 Utah's Premier Outdoor Wedding Reception venue. 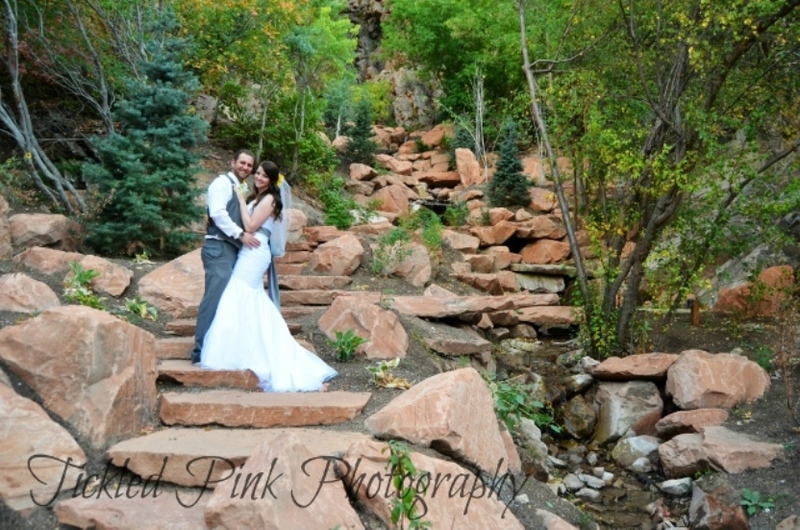 We highly recommend Louland Falls as your wedding venue! We had the most enchanting wedding reception at Louland Falls! What a great memory! It was an easy choice to say yes to Louland and they did not disappoint. Can't thank you enough for my dream wedding! We recently held our wedding at Louland Falls. What a wonderful and joyous experience! 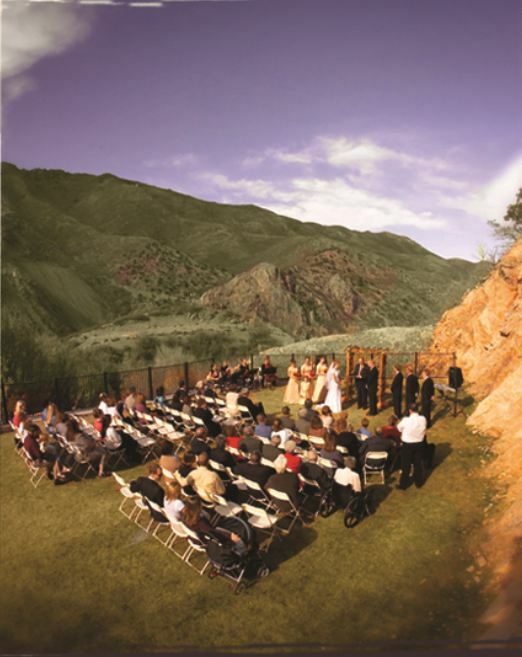 Get A FREE Brochure from "Louland Falls"
Louland Falls is the ultimate outdoor wedding venue in the Salt Lake City Utah area. Louland Falls is best described as rugged and natural; mother nature at her best! 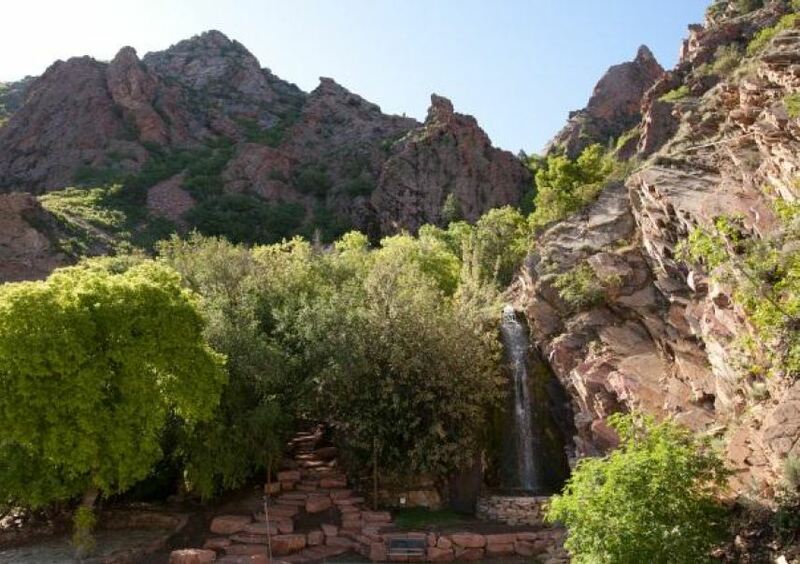 Red rock cathedrals tower above with cascading waterfalls filling the air with their own music. Wedding guests are left breathless upon stepping onto the main party terrace. 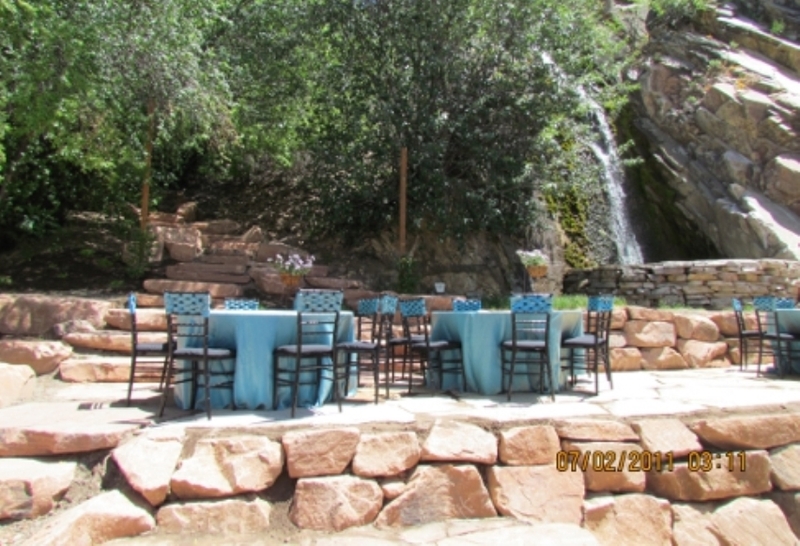 Our 45′ natural waterfall (at the top of the trail) runs all year and is the perfect backdrop for your wedding reception. Our 50 foot man-made waterfall is turned on (weather permitting) in the 2nd week of May and turned off by the 3rd week in October. Louland Fallls offers a 40-foot by 40-foot heated and air conditioned pavilion with expansive windows to take full advantage of the spectacular scenery during your wedding reception. Brides prepare in a spacious dressing room while the groom relaxes with massage chairs and a X-Box 360 game system on a 46″ screen. We are located just 3 miles from Salt Lake City. 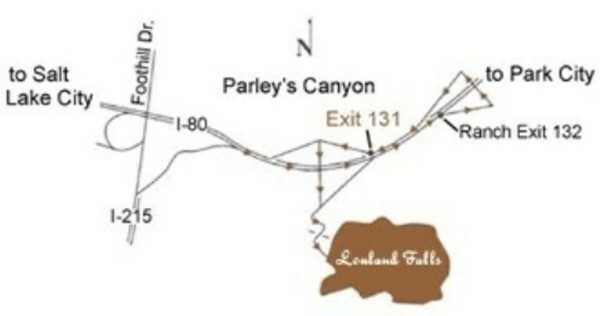 Take exit 131 as you are traveling westbound on I-80 in Parleys Canyon. If you are traveling from Salt Lake City, take exit 132 and enter I-80 westbound to take exit 131 – see map below. 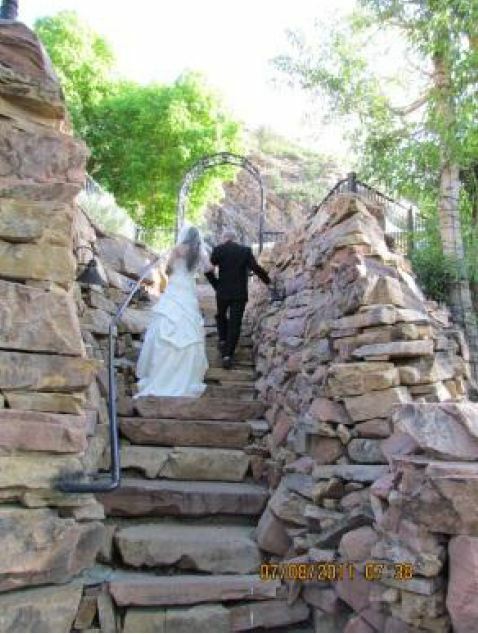 Please mention Salt Lake Bride when you contact Louland Falls! Picking a wedding venue and the wedding planning process can be confusing and overwhelming...but not with Mark Petrey and the Louland Falls staff! From beginning to end, everything just ran in the background and went smoothly. Not once did we have to worry or stress about something from the planning process all through the day of the wedding...it all went so great! We also loved that they had a lot of items that we could choose to use if we wanted (like linens for example). Mark was always quick to respond to emails and picked up the phone when we called which put our minds at ease. The venue itself is just stunning. Each one of our guests commented how beautiful it was. It’s honestly just a hidden gem! The grounds are kept very nice, the arbor makes a statement with its size yet somehow just blends in with the surroundings all at the same time. The grass was green, everything is surrounded by trees and greenery and the red rock walls are stunning. Walkways were cleared and the waterfalls are fantastic! You really couldn’t ask for a more beautiful wedding venue than this and a better staff to work with. Some of our guests actually guessed the total cost of our wedding as double what it actually was...and most of that was due to how wonderful the venue was! We loved that there was also an indoor area where the food was served from and also in case there was inclement weather, we had a place to go. The spaces for the bride and groom to get ready in were also fantastic with a “common” space that you could hang out in before everything started. We couldn’t have had a better experience and a more perfect wedding than we had and the venue is what set the tone for the entire experience. If we had to do it all over again, we wouldn’t change a thing! 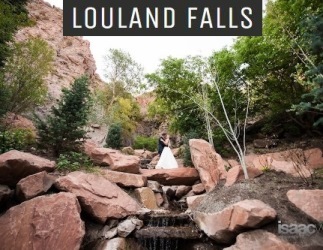 Do not skip on Louland Falls as your wedding venue, we highly recommend it! We had the most enchanting wedding reception at Louland Falls! The setting: stunning! The food: truly exceptional! Our Bride and Groom were looking for an indoor /outdoor fresh air kind of place and this was perfect. The food was such a big hit with everyone! I couldn't have been more pleased. It was so amazing to dance under the stars next to the dramatic water fall and red cliffs. We had all ages attending and all enjoyed the venue. Little kids loved running in the grassy area and exploring the paths that wind up around the falls and stream. The millennial crowd and older crowd all enjoyed the romantic, dramatic setting. The staff was very easy and amazing to work with and took care of our every need--super polite, helpful and professional. We had some unusual requests and they were very willing to accommodate our fun plans. Not many places are so flexible. What a great memory! I had my wedding in the beginning of June and I cannot tell you enough how beautiful this venue is. 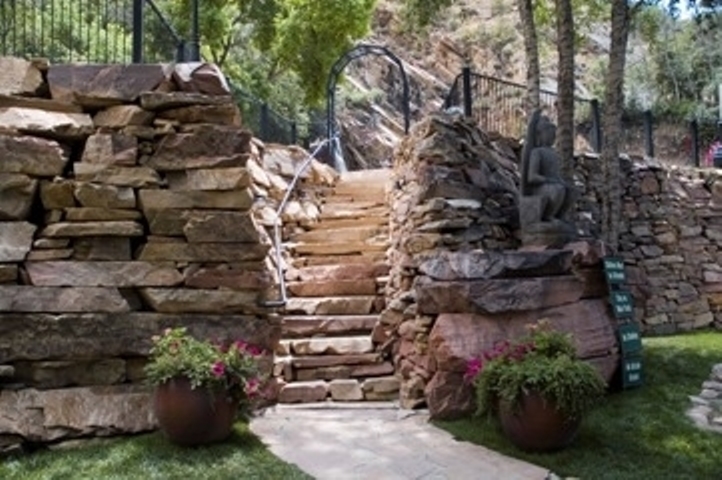 It's spacious for guests to walk around and climb the steps up to the falls; the scenery fills in for any decoration needed. Many guests told me how amazed they were at the beauty and location of this venue. Staff is super helpful and available during setup and take down. As the bride, I am sure I only saw a portion of the help provided that day but I remember an hour before guests arrived one of my family members asked for a ladder to decorate the arbor and the ladder was promptly brought over for decorating. Another detail I must mention was my last minute idea for the venue to shut off all its lights during our glow stick sendoff and they easily made my idea happen. As guests lined up along the entrance stairs, my husband and I danced under the stars for a moment and then exited past all our friends. As a final note, In preparing for the wedding, Mark, the owner met with us twice, prior to the wedding and gave us great recommendations for linen, alcohol, food, and plenty of advice on how to plan for our wedding day. Choosing this location was easy given the amenities it provided: tables, chairs, bridal party suite, ample parking, golf cart rental for parking transport (guests were happy for that! ), sound system, beautiful patio lighting. It was an easy choice to say yes to Louland and they did not disappoint. Can't thank you enough for helping me put together my dream wedding! Everything came together perfectly! Lize and her staff were so kind and helpful throughout the entire process of wedding planning! There recommendations on vendors was outstanding as well! Thank you! We recently held our wedding at Louland falls. What a wonderful and joyous experience. Lize and all her staff were incredible, very helpful and patient, and just a pleasure to work with. The venue is jaw dropping gorgeous and was the backdrop to a very magical evening on our special day. Thank you Lize and staff. We will never forget our wonderful wedding day! !